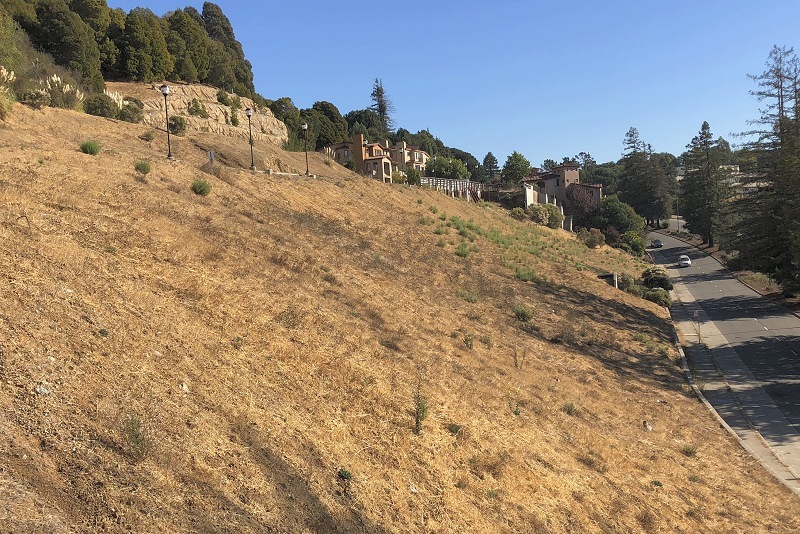 Rising sea level is a threat to the Bay area. Already, king tides are flooding the levees and seawalls built for the last century’s ocean. 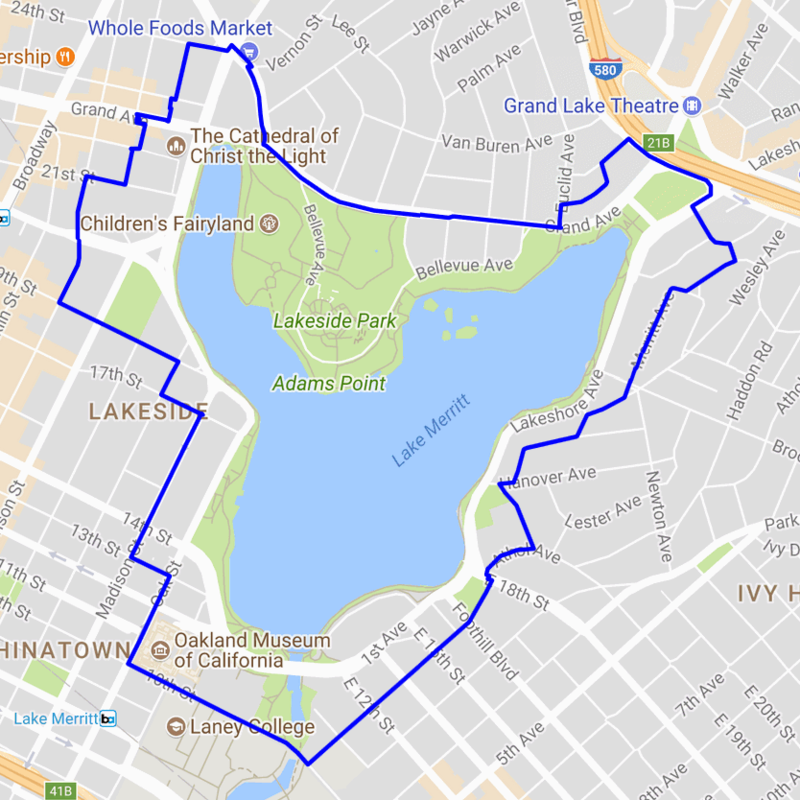 I touched upon this topic a few weeks ago with my proposed walk around Lake Merritt in 2100, assuming that the Bay will be a couple meters higher than today. Yesterday, happenstance allowed me to witness a promising project that has built an experimental coastline modeled after a natural one — specifically, a living water filter meant to sit between the low tidal mudflats and the higher levees holding the Bay back. 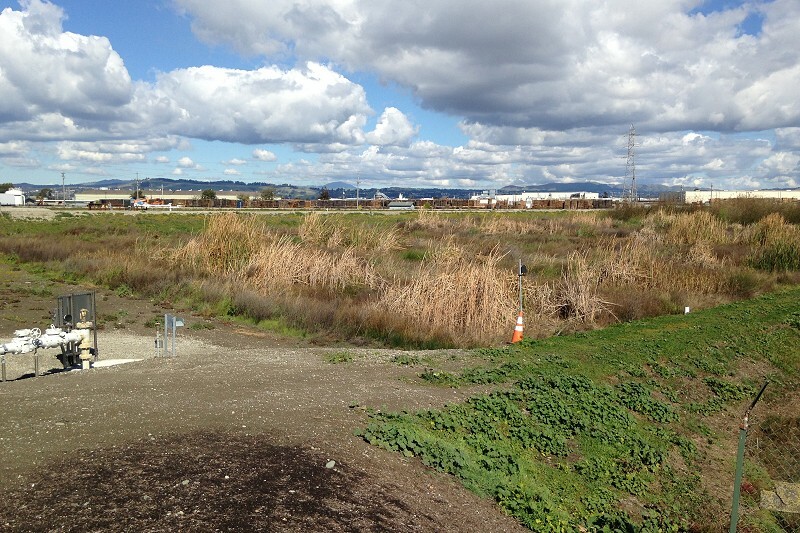 The Northern California Science Writers Association arranged for a group of members to visit the Horizontal Levee Project, on the grounds of the Oro Loma Sanitary District wastewater treatment plant in San Lorenzo. Let me sketch the idea behind the project. 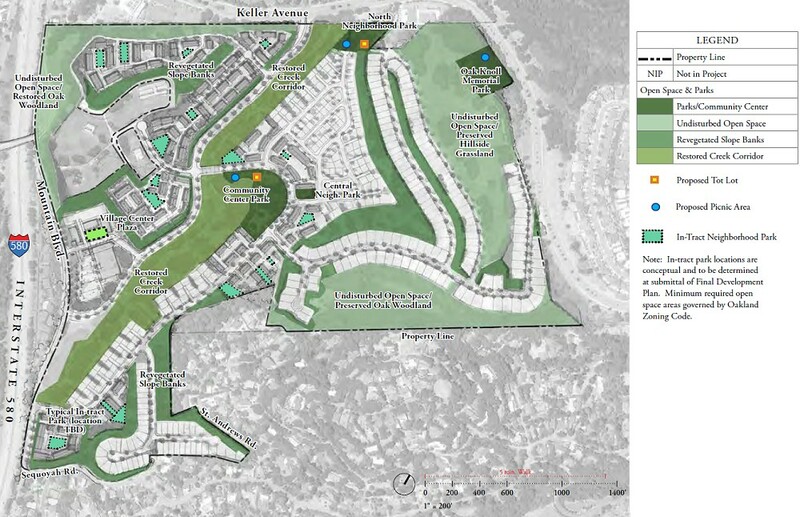 To begin with, the natural coastal landscape has been totally messed up. It used to be a nice grassland plain, gradually sloping down to a series of wetlands that merged organically into the tidal marsh, mudflats and open Bay waters. Water from the hills percolated gently down the streams and through the ground, nourishing a lovely ecosystem full of species. American settlers cut off the top part of this landscape and covered it with buildings, dammed and diverted the streams, then filled in and walled off the lower part with levees. Today the coastal wetlands are cut off from the water and sediment from the hills, and meanwhile the sea is creeping up and washing them away. 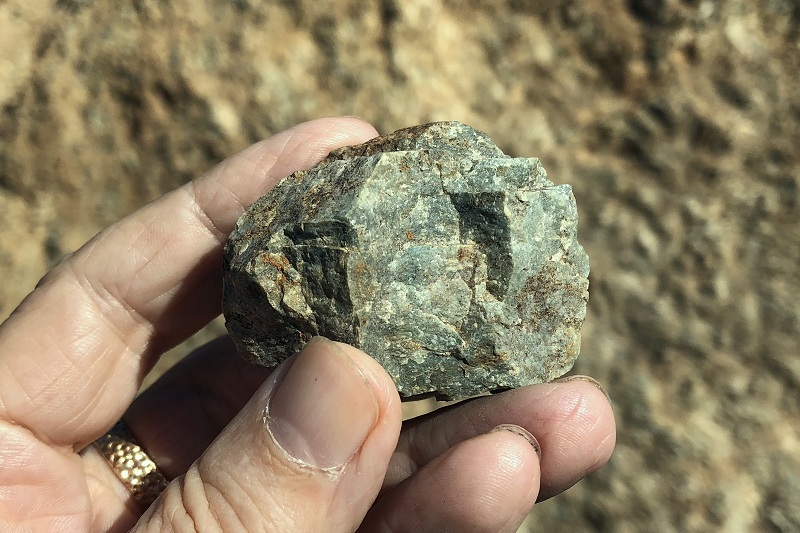 The wastewater part is crucial because we have lots of it, we can control its flow, and the new slope — scientifically, an ecotone — cleanses the wastewater of nitrates and other hard-to-remove compounds better than treatments costing 10 times as much. All while feeding a splendid tidal marsh that resists storm waves better than concrete walls! Our visit took place on a brisk, bright day by the bayshore. 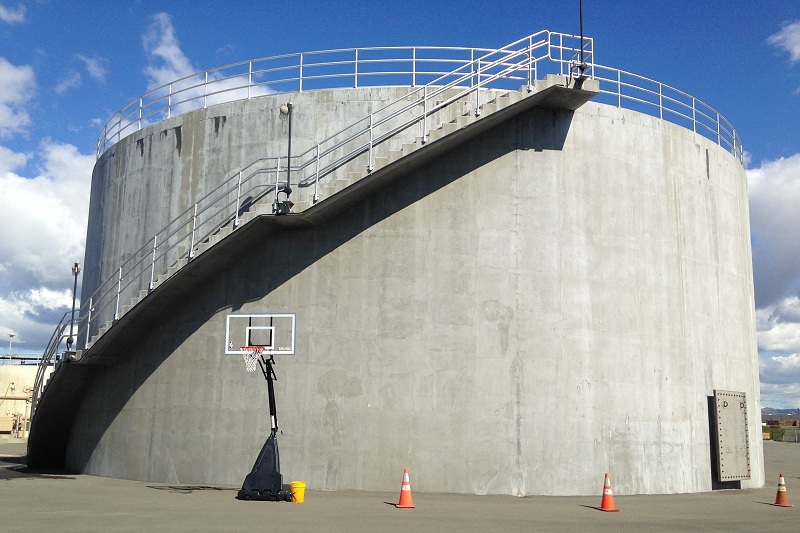 The Oro Loma Sanitary District treatment plant is mostly clean, stark and Brobdingnagian. But the operators found space to put up this pilot project on their own land, where they didn’t need so many permits. 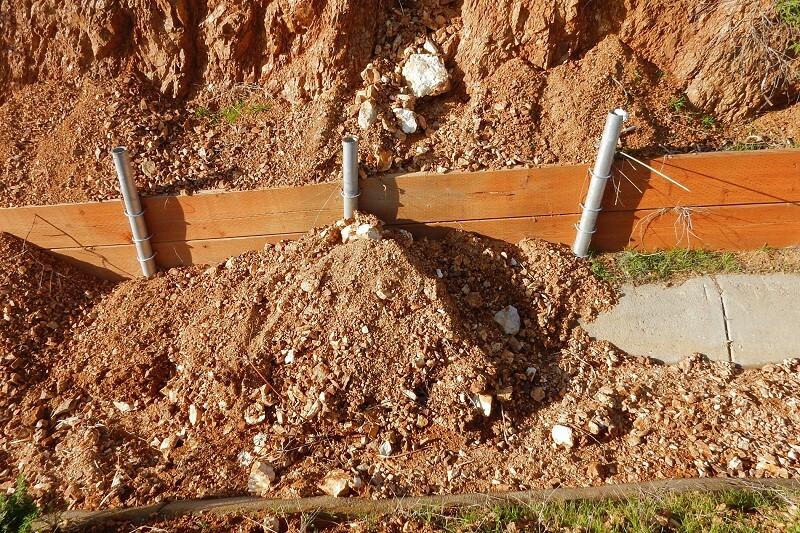 They built a gently sloping earthwork, installed pipes at the top and drains at the bottom, then raised a mix of plants from local sources to seed it with, using these planter boxes. 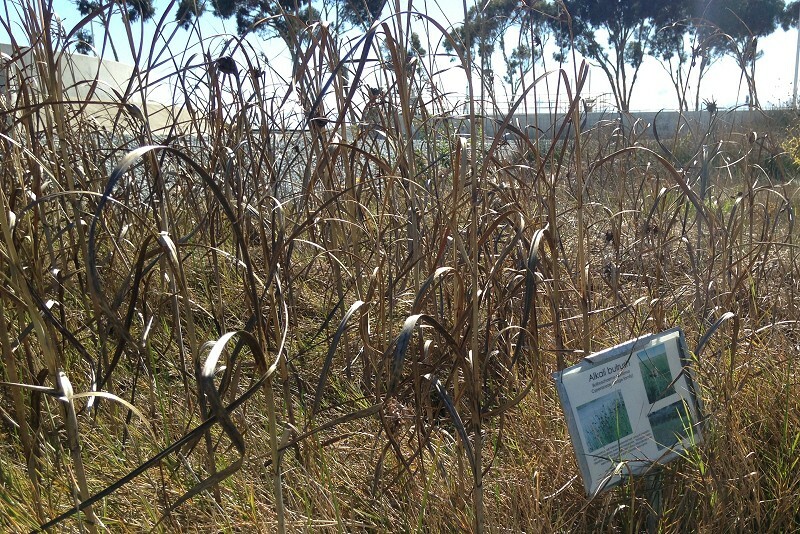 Project staff noted that the alkali bulrush is particularly good at resisting storm waves with its tall, stiff stems. Seeding and planting happened in the rainy season of 2015-16, so this lush jungle of native marsh plants on the ecotone was just two years old. It’s so dense that invasive weeds, even pampas grass, don’t stand a chance. And the water coming out at the lower end is really clean. (Even so, the water was pumped out through the white pipes on the left and put back into the treatment stream.) 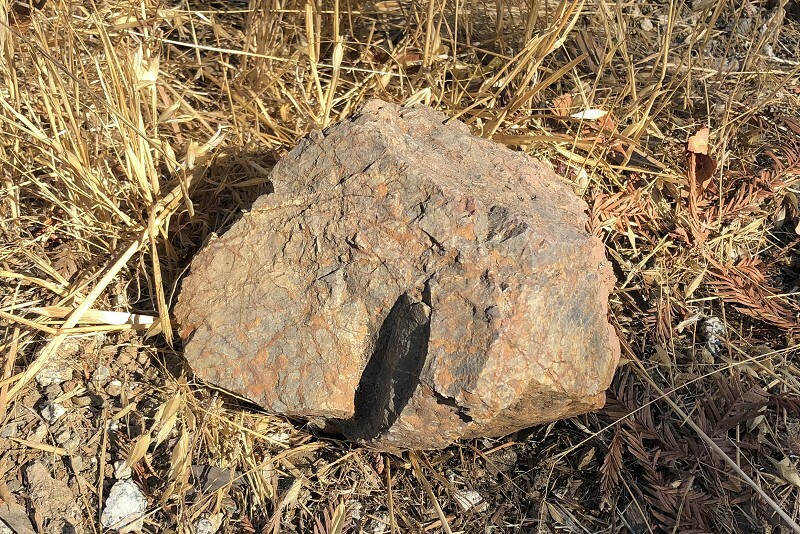 Soil bacteria actually convert the nasty nitrate to nitrogen gas, so it isn’t just trapped in the dirt or building up within the plants. 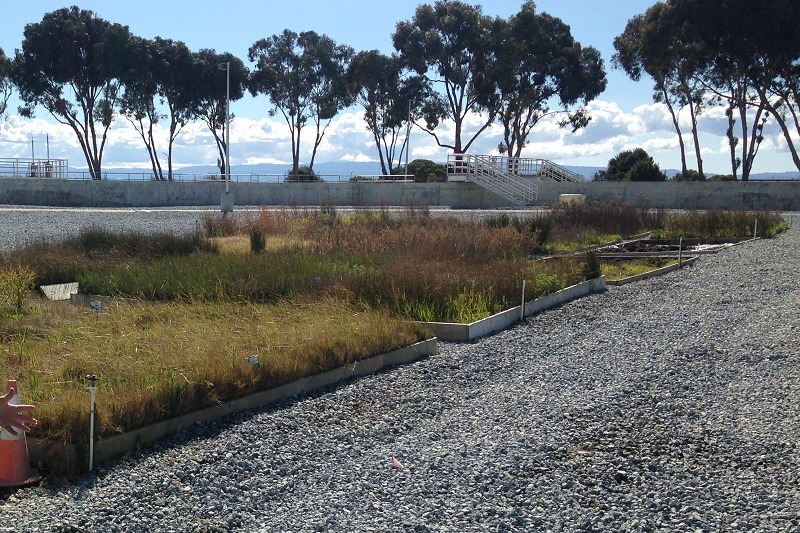 Water treatment agencies all around the Bay have their eyes on this experiment. It looks like the design will be flexible enough to be adapted for as much as 5000 acres of wetlands, a significant fraction of the coastline that’s particularly vulnerable to sea rise. Awareness of sea-level rise needs to happen faster than the rising sea itself. The speakers yesterday found that the hardest nut to crack in moving things forward is regulations: interpreting them creatively, coordinating the regulators, combating inertia. To envision, scope, design and plan improvements to the shoreline literally takes decades, meaning that we have to aim for a target in the year our children reach our age. 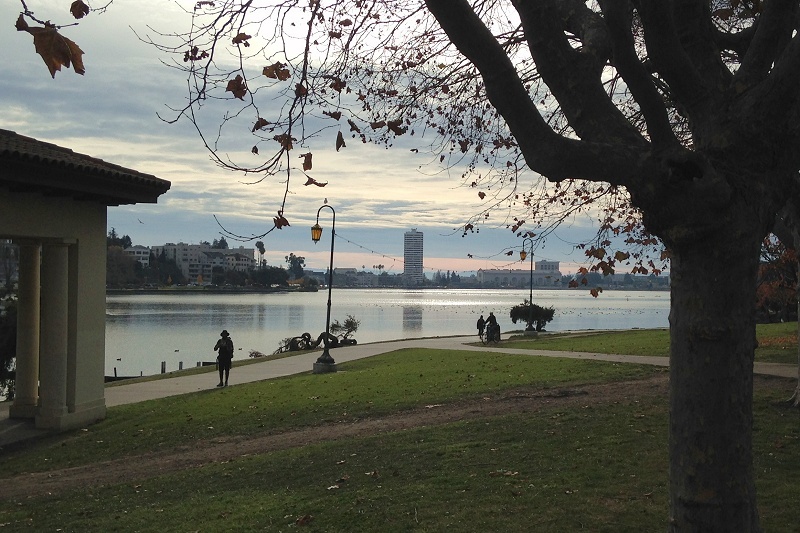 Everybody walks around Lake Merritt. I do it all the time. But I got the wacky idea of a walk that circles the lake without “touching” it — sort of a “floor is molten lava” version — and pedestrian paths count. Here’s what that would look like. That’s a fun walk through some fine neighborhoods, and about 1-1/2 miles longer than sticking to the shore. The only quibble is at Grand and Euclid: you might be safer from the lava if you left Grand a block west, up Bellevue, but you’d miss some rare little streets and a stairway. Then I thought, What will it be like after a century or so of sea-level rise? How would people get around the swollen lake in 2100? Laying out that walk required more care. The forecasts of future sea levels vary widely — so much depends on Antarctica and human actions — but a summary by NASA puts the worst-case upper limit at 2 meters above today’s elevation by the year 2100. The map shows we’d lose nearly all of the shoreline roads. Along the west arm of the lake, most of Lakeside Drive would go under, and the water would reach up Harrison all the way to Whole Foods. In Lakeside Park, the bandstand and the whole bird sanctuary would be submerged, though the rest of the park is on a Pleistocene marine terrace and would stay dry. The east end of the lake would really take a hit. 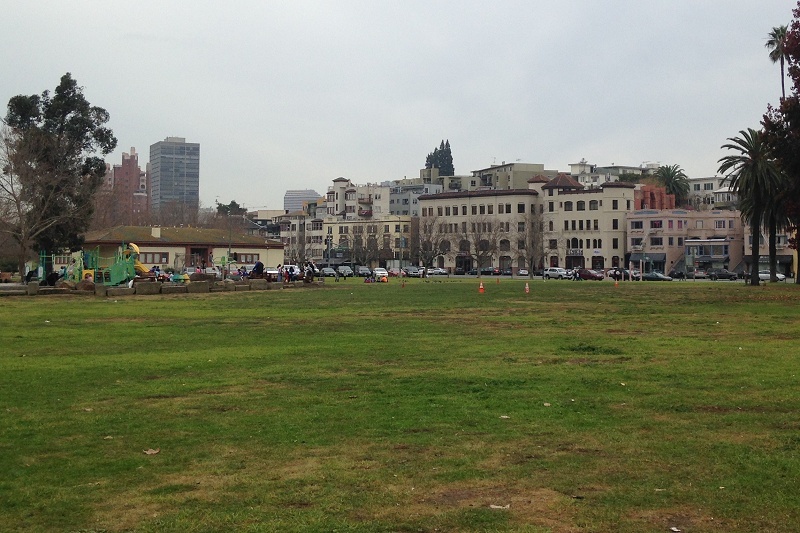 Forget the pergola — all of Eastshore Park would turn into tidal wetland, and Splash Pad Park? It’d be just Splash Park. Grand Avenue as far as Elwood we’d have to rename Grand Canal. All the properties lining Lake Park Avenue would get their feet wet, including the Grand Lake Theatre, and a bunch of shops on Lakeshore. Down at the boat landing, E. 18th Street would be underwater all the way to Park Boulevard, wiping out the heart of that commercial district. 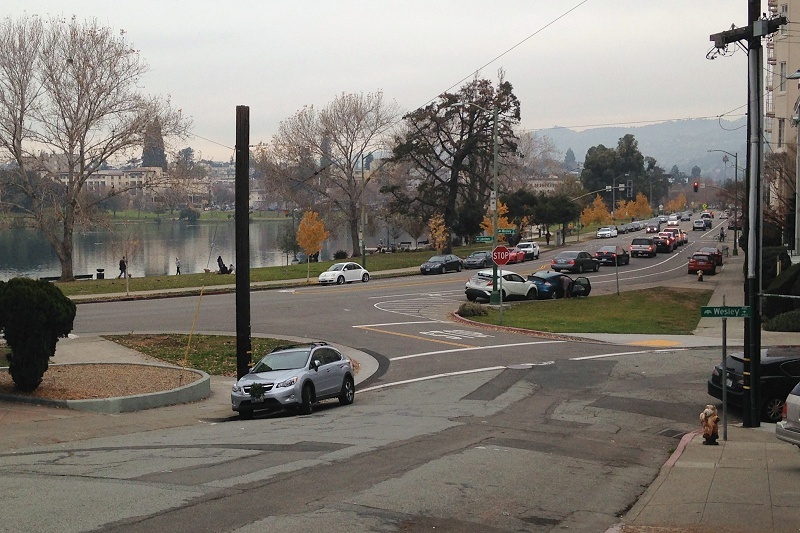 And the Lake Merritt Amphitheater would mostly go under, though the roadway — Lake Merritt Boulevard — would be fine. So would the pedestrian bridge, for what that’s worth. 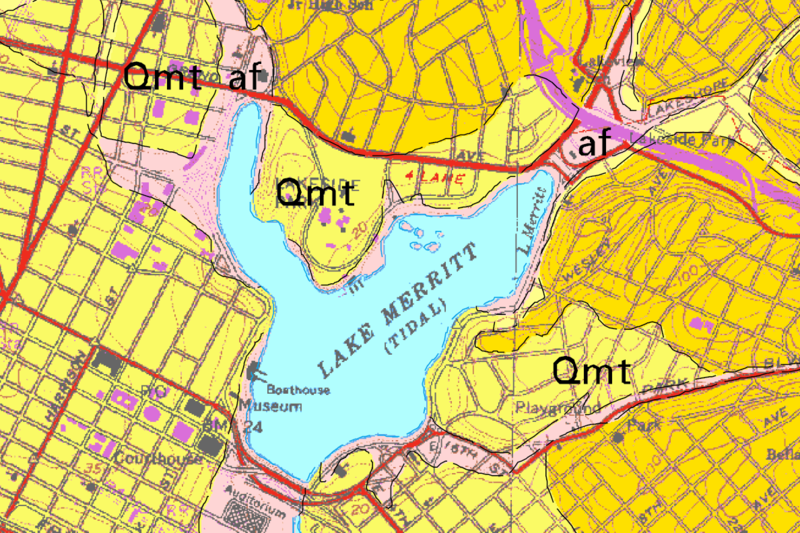 The geologic map shows that the new wetlands around the lake would be in areas of artificial fill (af), and because fill isn’t built up any higher than strictly necessary, it’s vulnerable to rising seas. In planning my round-the-lake walk I kept things simple and assumed the roads in these areas will be abandoned (but see more below). Walking around the lake in 2100, you’d have to give a wide berth to “Thomas L. Berkley Creek” under 20th Street, Glen Echo Creek under Harrison, Pleasant Valley and Trestle Glen Creeks under Grand Lake, and Park Boulevard Creek under E. 18th. 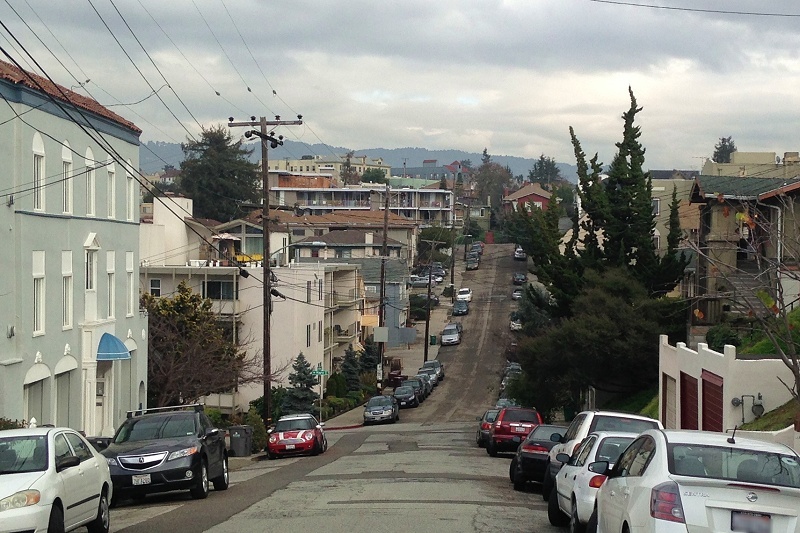 These detours will put you up in the hills, because that part of town is either really flat or stairstep steep. On the positive side, that terrain (lobes 3 and 4 of the Fan) is what makes Adams Point, Lakeshore and Cleveland Heights so charming. 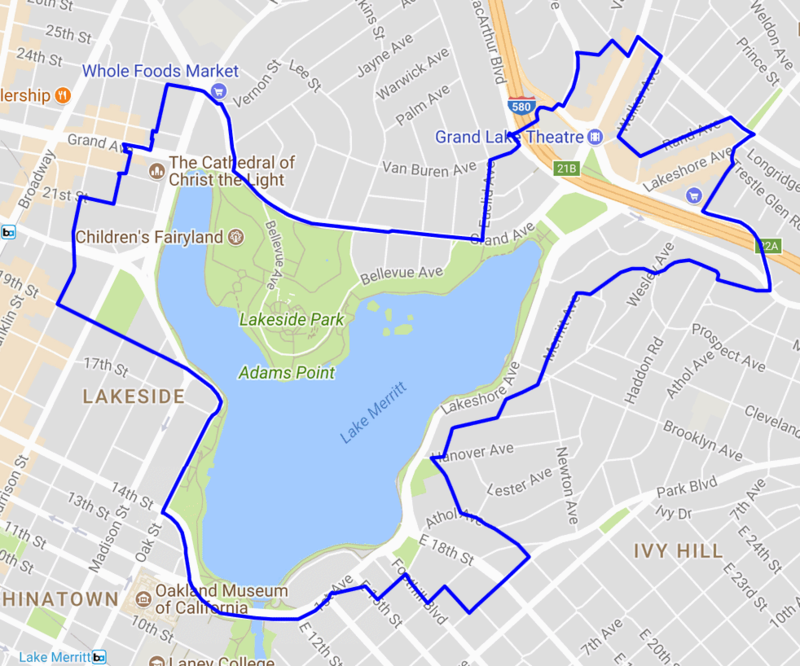 Given all that, I came up with this 2100 Walk Around Lake Merritt. Notice that almost none of it actually “touches” the lake. The shoreline roads will be swamped, along with each of the stream valleys entering the lake. As I field-checked this walk by eyeball, at two places in particular it looked like you’d still need wellies. One spot is Sunset Cove, at the north end of Wayne where it meets Wesley Avenue (at the end of the word “Lakeshore” on the map). If that’s off limits (and the inundation map says it is) you’d need to climb up Newton instead and come down Stow, which would definitely call for a pizza slice from Leaning Tower (if it’s still there in 2100) to get you over that hump. 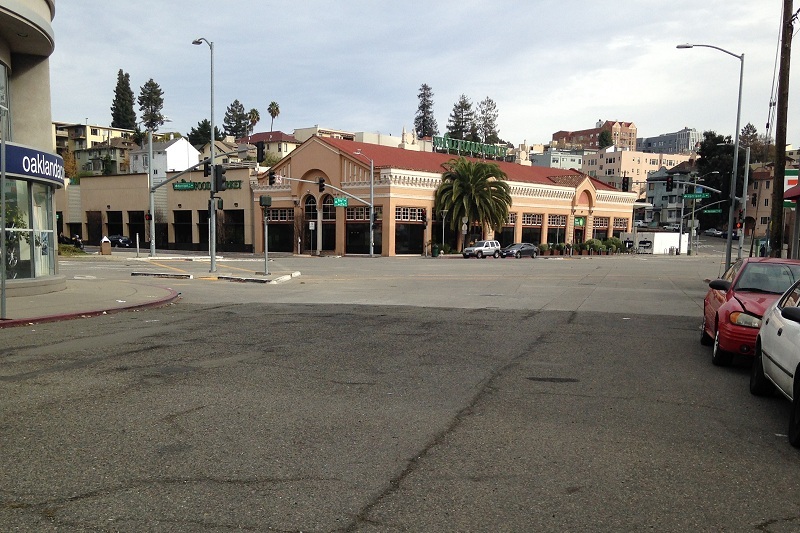 The other spot is on Harrison at the Whole Foods. 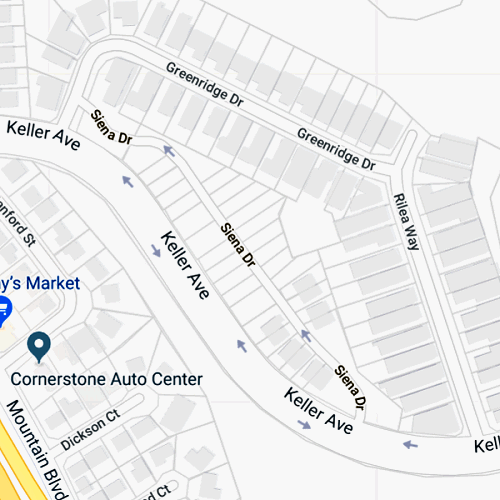 If Bay Place (the continuation of 27th Street) isn’t above water, you’d have to detour up Vernon and traverse the hills of Adams Point on Lee Street to get back down to Grand Avenue. 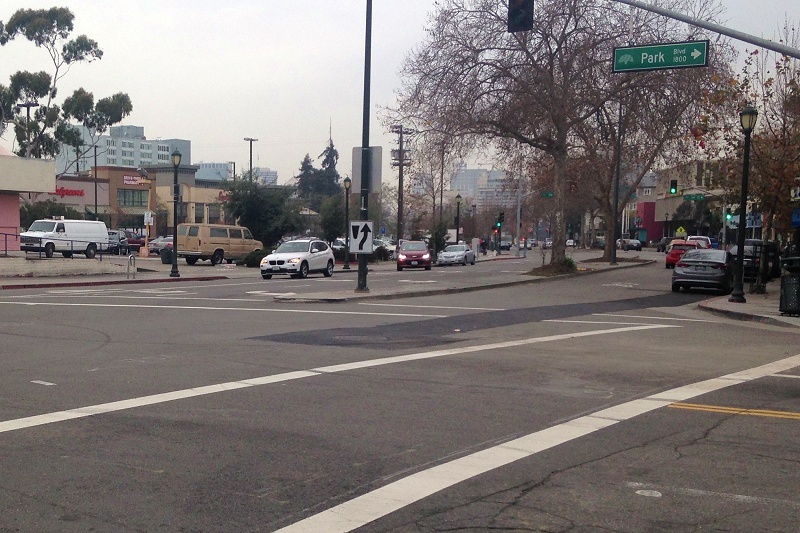 But you might as well stay up high, because the only way across the freeway, short of climbing all the way up to the Chetwood Street overcrossing and back down Santa Clara (about a half-mile detour), is the amazing pedestrian/bike crossing at the end of Van Buren Avenue. Here’s the view from the west end over I-580. 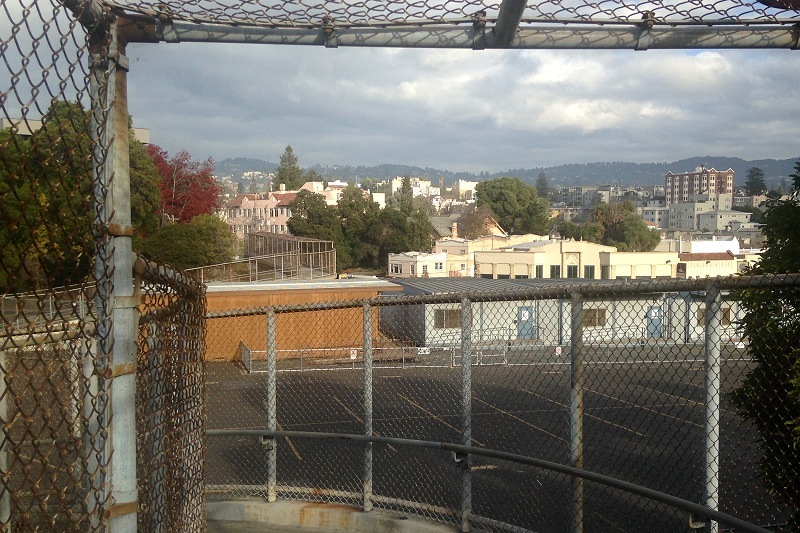 And from the end of the cage section, you can see the east end, where it winds behind the Lakeview School and then over the freeway onramp. 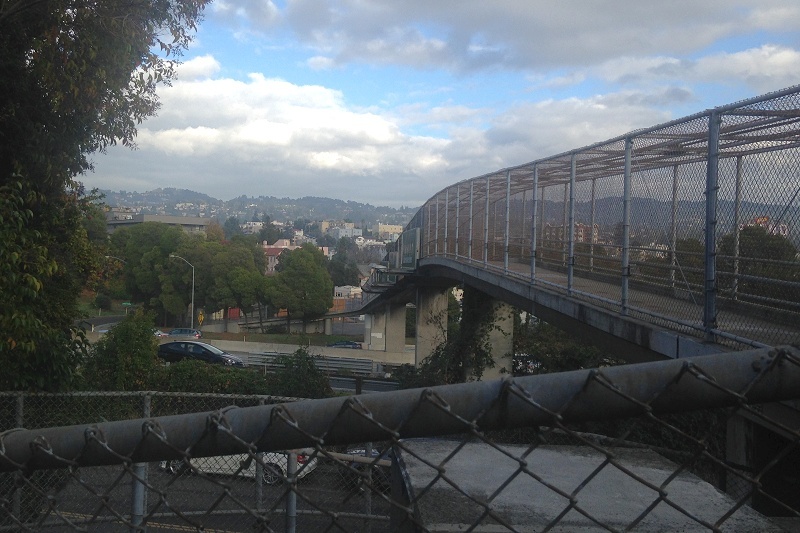 If I ran this city, I’d refurbish this valuable bypass with an arched cage of clean chainlink that allows better views. And while I was at it I’d build another overcrossing on the other side of Grand Lake, connecting the severed parts of Wesley Avenue, because the climb up to MacArthur and down again is oppressive (though picturesque). And why not? Because in the next hundred years we’ll be doing a lot of building and rebuilding. 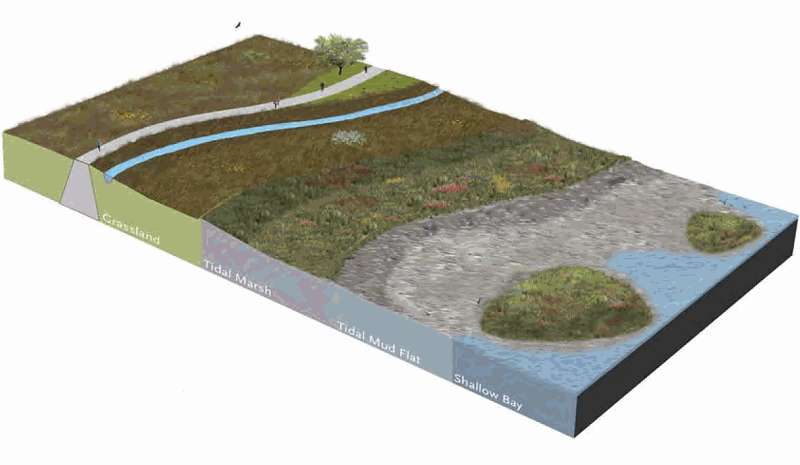 Taking this walk will force you to picture your great-grandchildren’s landscape in detail. And in my vision, unlike my fever dream, the lakeside streets are too important to abandon to the rising sea. They’ll be built up. We’ll still be able to walk around the lake along the shore, and we won’t have to take the route I mapped out. However, the buildings along the shore are a different story. 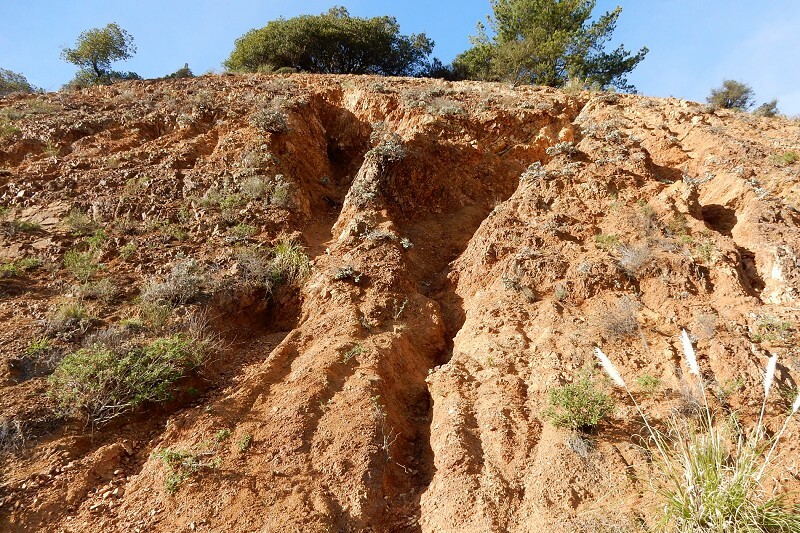 Here’s a little-appreciated geological fact: as the sea rises, so will the groundwater in the dry land along the coast. Basements that are a few feet above the water table today will be permanent pools in 2100. Streets laid down on dry ground will find their roadbeds turning mushy, more prone to traffic damage. In that respect, rising sea levels will affect things much farther from shore than the tides reach. 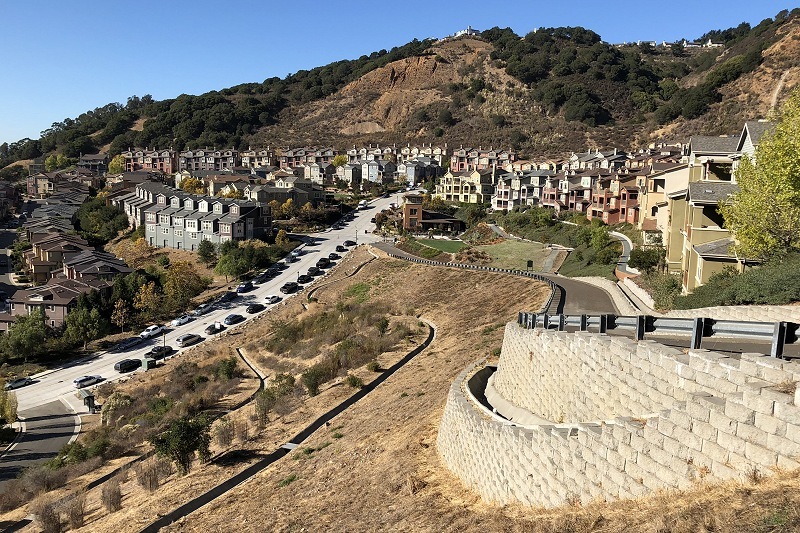 By 2100, today’s lakeside buildings will have gone through two or three more mortgage cycles — plus at least one damaging earthquake — and will be a century older. Given that, I think the apartment buildings on Lakeshore, for instance, will be dismantled by then and their lots condemned. And the road will move onto their old footprints. 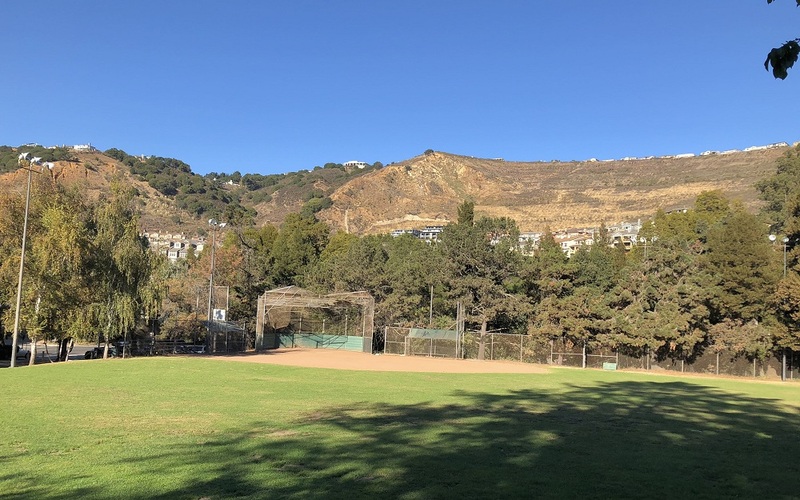 The largest and most valuable structures will stay on — the Kaiser Center and its neighbor the Lake Merritt Plaza building, the cathedral, 1200 Lakeshore, St. Paul Tower, the Grand Lake Theatre and so on. Their owners will cope by reinforcing the basement levels and installing permanent sump pumps. Buildings of lesser prestige, despite their historic value and charm, will face hard choices well before 2100. 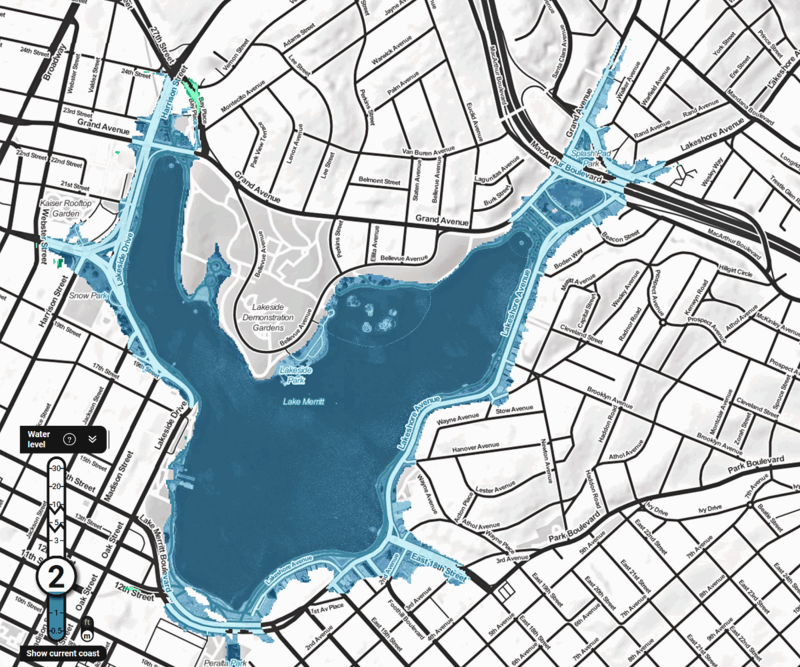 The city will need policies in place to handle sea-level rise. But it’s possible that everything we do to cope can be done in an orderly way. That will require far-sighted city officials, and voters, to ensure sound long-term budgets and timely bond issues. That will be a test. On the other hand, a lot can change in a hundred years — just look back to 1918. This post is dedicated to the people born this year, who will be 82 years old in 2100. 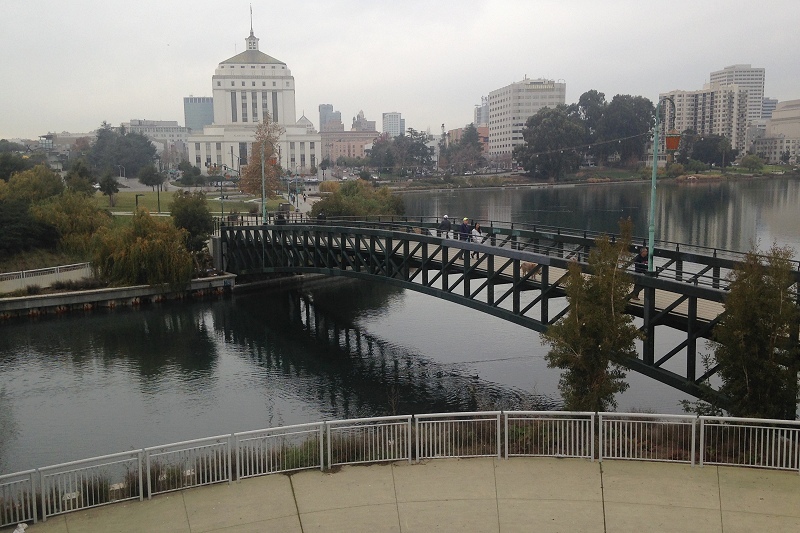 Last month the city of Oakland released its long-awaited resilience plan, the Resilient Oakland Playbook. “Resilience” is the 21st-century name for the concept that communities can get up quickly when they’re knocked down, and avoid being knocked down in the first place. 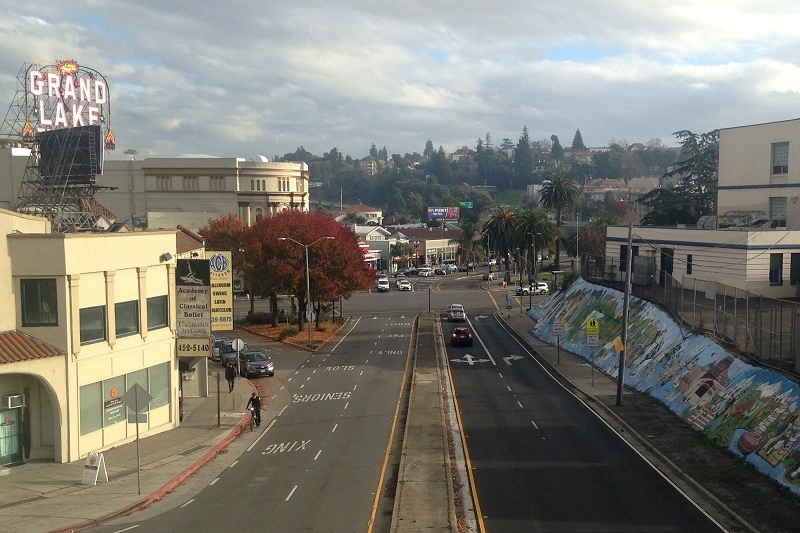 Resilience in Oakland means equitable access to quality education and jobs, housing security and community safety. It means building vibrant infrastructure to better prepare for shocks like earthquakes and stresses like climate change. 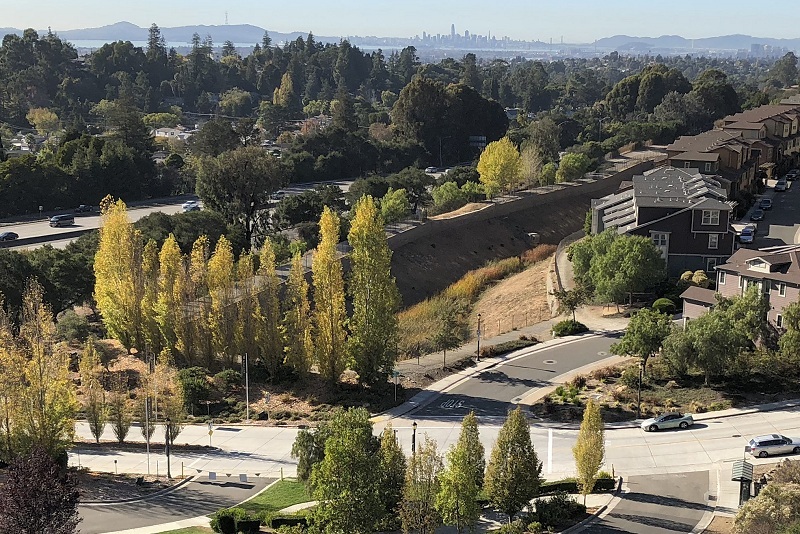 In Oakland, resilience means catalyzing our diverse pool of talents and perspectives to tackle these challenges, both inside and outside our government, with particular focus on addressing the needs of the most vulnerable members of our community. This will take some getting used to. 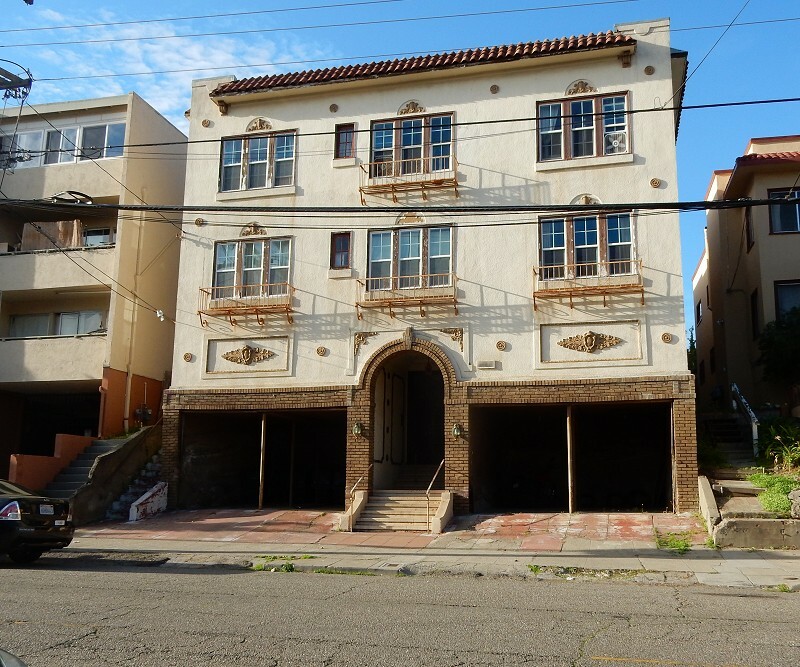 The geologic hazard of earthquakes is given its due, although there are no new ideas in the playbook beyond the ongoing, snail’s-pace work of encouraging retrofits of old soft-story apartments. 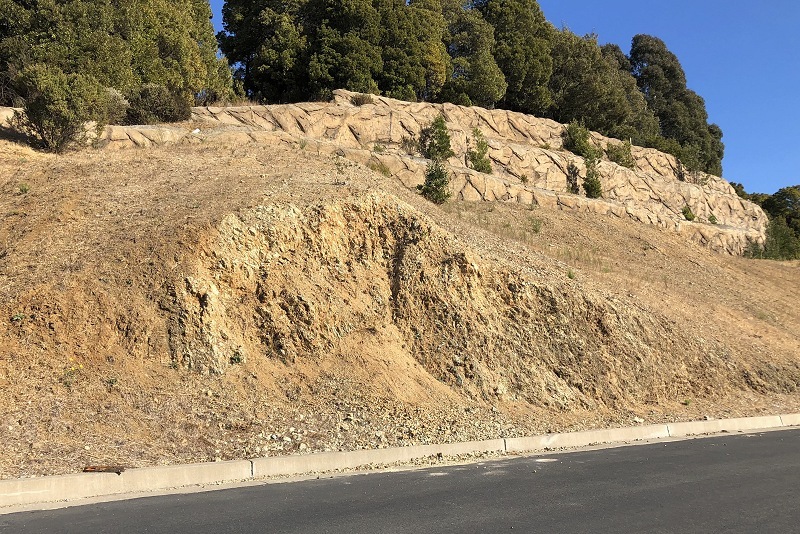 The Earthquake Engineering Research Institute, a major source of relevant knowledge that’s headquartered in Oakland, didn’t participate in writing the Playbook. Emergency preparedness is represented by a seven-month “Love Your Block” initiative in the Fire Department’s valuable CORE program. That was supposed to start in October, but there’s no sign of it on the city’s website. The geologic hazards of climate change (a possible rise in floods and wildfires) and sea-level rise are pervasive in the Playbook. That’s OK, although I consider them remote problems. They will slowly creep up on us, noticeable only if you take a snapshot every decade. We need to make long-term plans and float bond issues to deal with them. 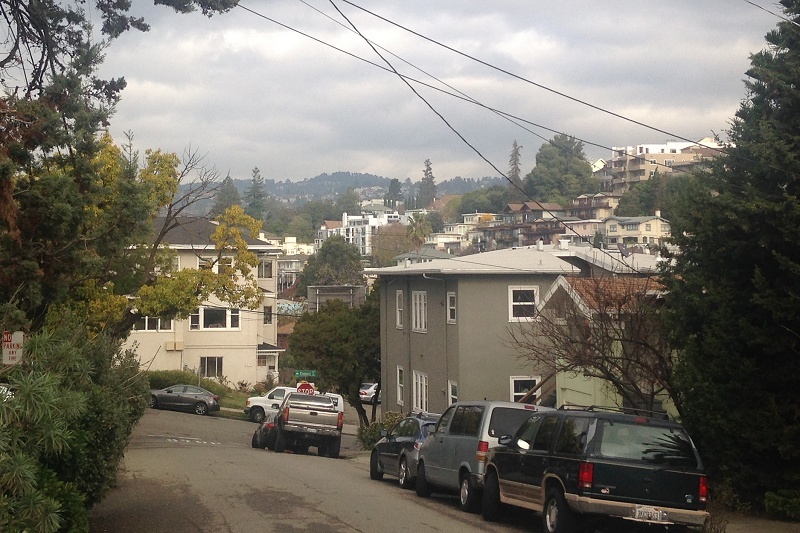 But there’s no mention of the mud that wipes out roads in Oakland every year. A “vibrant infrastructure” has to deal with our chronic landslides. 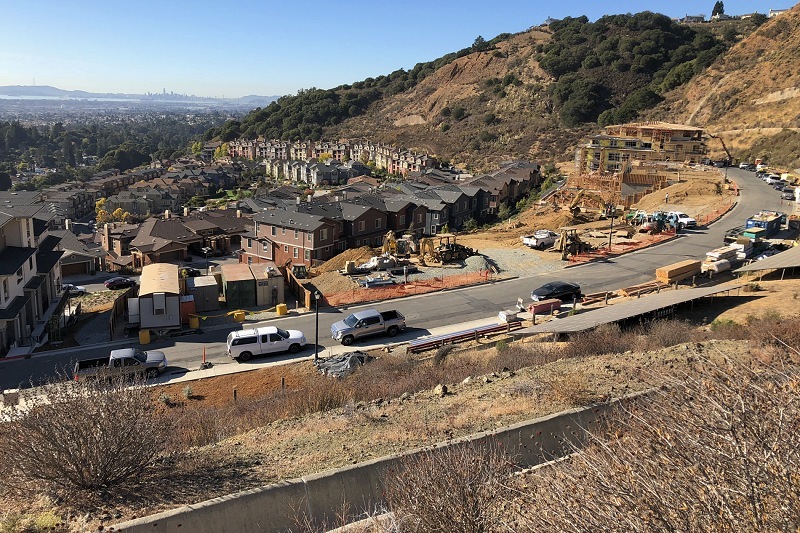 The word “landslide” isn’t in the playbook once — homebuilders in the hills, you’re free to continue business as usual. 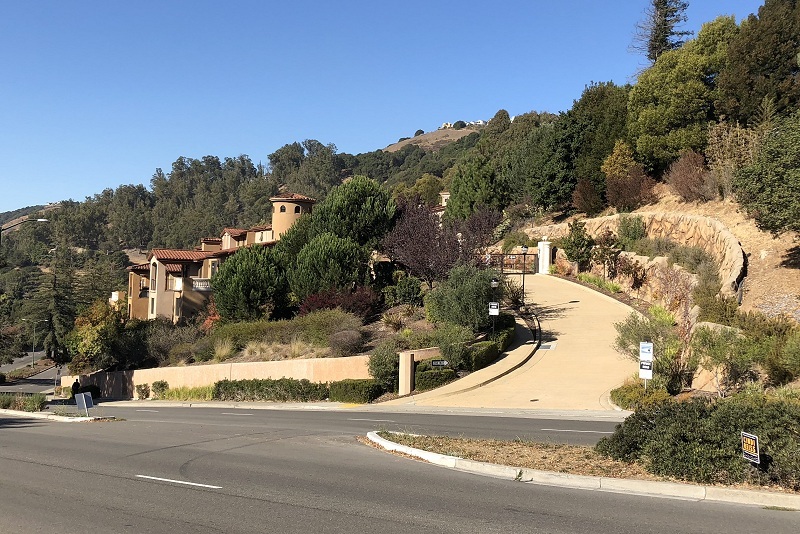 Houses on alluvial hillsides, you’re off the radar. Disasters don’t wait decades, and neither can we. Maybe the Playbook is how we’ll get to resilience. I’ll be happy if it is.